Park Yoochun successfully wrapped up his fan meeting in Taiwan. 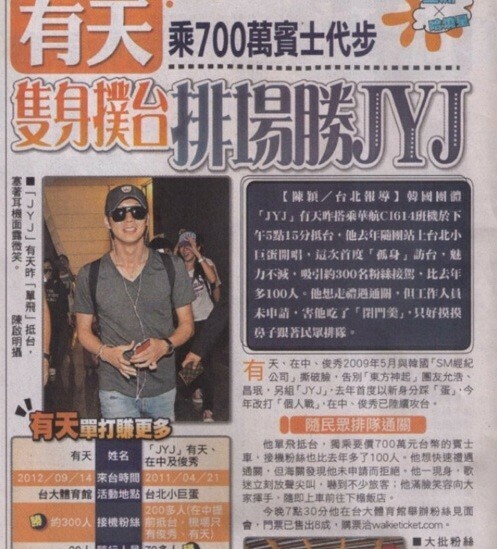 On September 13, Park Yoochun of JYJ landed at the Taipei Airport where a countless number of fans and reporters were waiting for his arrival. The couple hundred people who were waiting at the airport began to scream as soon as they saw Park Yoochun and over 20 different media sources were struggle to capture every moment of his arrival. Recently, the SBS drama “Rooftop Prince” is highly popular in Taiwan. It has been reported that of all the dramas that aired after 2011, “Rooftop Prince” received the highest viewing rate and set a new record in Taiwan. Also, during a Taiwanese TV show called, “Yes Entertainment” and one other show, approximately 22,000 people were surveyed. When they were asked, “The best male drama character in my heart?” over 71% of the people chose Park Yoochun. Yesterday (September 14), Park Yoochun held his fan meeting at the gymnasium of the National Taiwan University. As part of “2012 Park Yoochun Asia Tour Fan Meeting in Taiwan”, Park Yoochun played games with his fans as well as other activities to spend time with his fans. With about 4,000 fans in the audience, Park Yoochun spoke to them about his future plans as well as talking about filming dramas. All the fans who were present held their breath until Park Yoochun was finished speaking and screamed to show support as soon as he finished each statement. Park Yoochun will wrap up his “2012 Park Yoochun Asia Tour” on the 16th of this month in Thailand. 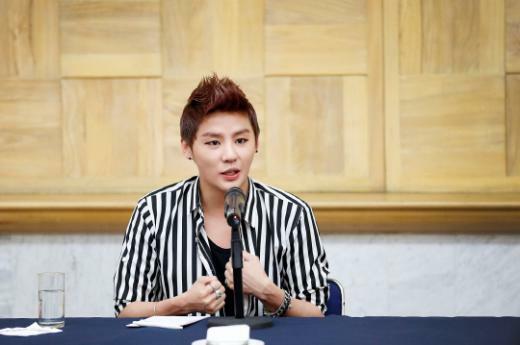 JYJ’s Jun Su recently talked about his ideal type. On September 5 at 2:00 p.m., Jun Su gave an interview to Korean reporters at Camino Real Hotel in Mexico City before holding a concert in Mexico. After releasing his first solo album, Tarantallegra, in May, Jun Su had concerts in Seoul, Thailand, Indonesia, Taiwan, China, Hong Kong, New York, and LA, meeting over 40,000 fans. On September 6 at 8:00 p.m., Jun Su will hold a concert at the Auditorio BlackBerry in Mexico City. He’s the first Korean solo singer who holds a concert in Mexico city. Jun Su also talked about his ideal type. Jun Su said, “I want to have a girlfriend. I don’t have a specific ideal type, but I like a girl who is polite and feminine. I’ve dated a few times, but I don’t have a girlfriend now. I think I will be kicked out even if I have a girlfriend now, though,” insinuating that he’s currently having busy days. Jun Su will also hold concerts in Brazil, Chile, and some European countries.